The McMillan Greenhouse is a wonderful place to visit all year, featuring the diverse plants that are a rare find in North Carolina–even at other botanical gardens. Collections peak seasonally, so make sure to visit the greenhouse at different times of the year to witness our plants’ seasonal changes. In addition to the collections listed below, a bed of winter-hardy palms (and other hardy “tropicals”), a rock garden, and a compact display of perennials and annuals surround the greenhouse building. These are all best viewed in spring and summer. The Greenhouse is wheelchair accessible and holds our classroom, library, restrooms, water fountains, and sign-in area. 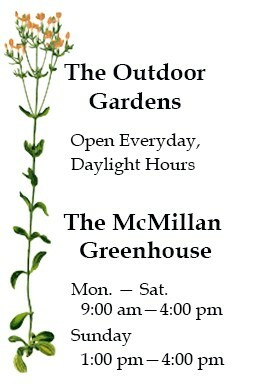 In addition to making the McMillan Greenhouse your first stop to sign-in, please make it your last stop to fill out a comment sheet; we always appreciate your input. We are the only botanical garden in the Charlotte area that features carnivorous and bog plants. The Venus Flytrap is a favorite among visitors of all ages. These plants are native only to the Carolinas and have become a threatened species due to the destruction of wetlands. They are not mainstream plants for home gardens because of their unrelenting need of very wet, peat-based soil. You can see a large, healthy collection of Venus Flytraps and other carnivorous and bog plants in the courtyard of our greenhouse. If you are looking to create a special bed of these fascinating plants at home, you can buy them from our gardens knowing that they were responsibly grown and harvested. Sickened by the destruction of Sarracenia in the Carolina wetlands, Dr. Mellichamp committed himself to growing hybrids of these carnivorous plants. While creating his hybrids, he selected plants based on their color, pattern, size, and vigor of growth. He created many different hybrids, ten of which were released commercially. 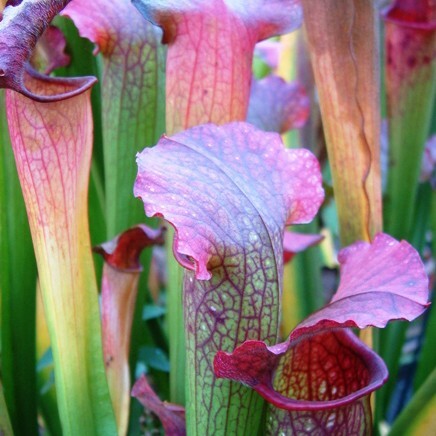 Mellichamp’s Sarracenia Hybrids were created at the botanical gardens of UNC Charlotte and UNC Chapel Hill. 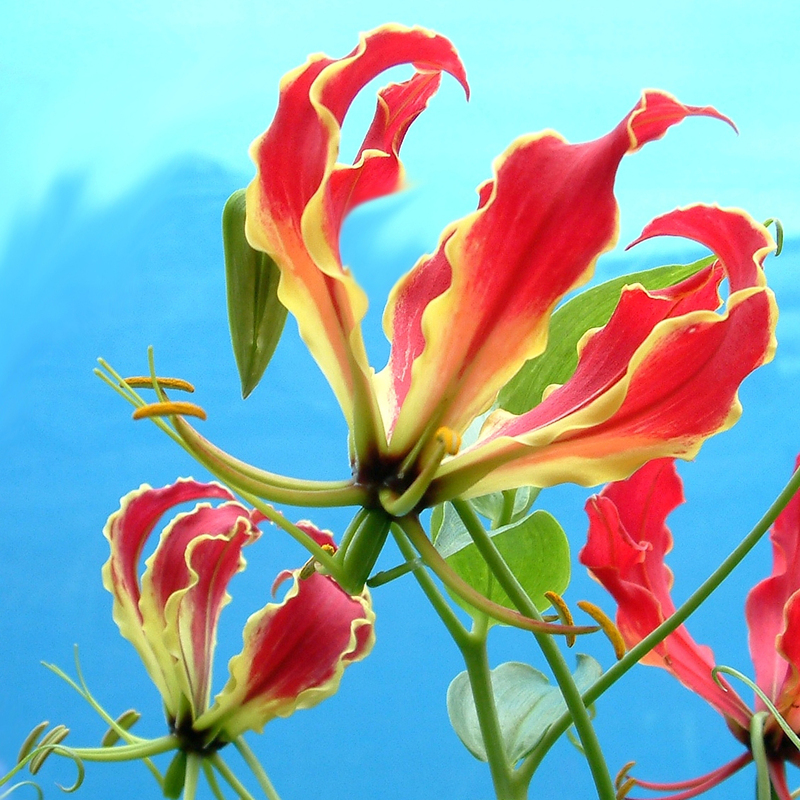 We are one of the few botanical gardens that grows and sells these rare, beautiful hybrids. If you would like to view Sarracenia (and other carnivorous bog plants) at their peak, come visit the McMillan Greenhouse in the summer months. In the Desert Room you will find the greatest variety of succulents of any regional botanical garden. 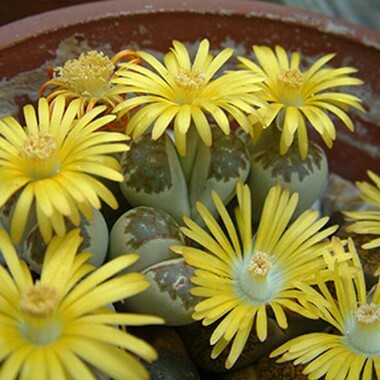 These succulents take surprising forms and may have you asking, “How is this a plant?” The Living Stones, named after their resemblance to stones, produce beautiful yellow blooms (pictured to the right). Many of these plants’ strange forms are adaptions to their naturally dry, sunny environment. Their grey color (instead of most plants’ green) is a natural sunscreen. Succulents also protect themselves from the sun through fuzzy spikes, which scatter light, or a waxy covering. Similar to the Titan Arum, some succulents produce a putrid smell to attract carrion pollinators. Visit this room to see, smell, and be surprised at the beautiful and strange adaptions of these desert plants. The Dinosaur Garden transports visitors to a prehistoric world filled with ferns and living fossils. 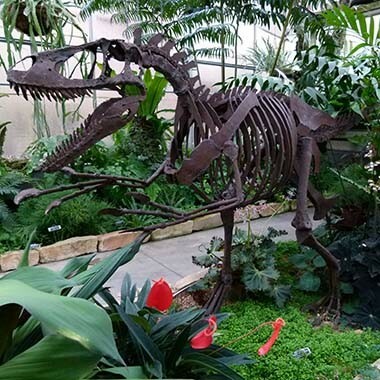 Our own resident dinosaur (sculpture) sets the mood for this lush space, which has the greatest diversity of ferns (and other fern-like plants) in the Charlotte area. One of our visitors’ favorite plants in this collection is the Rock Tassel Fern. As the most difficult to grow in this collection, this isn’t a plant you’ll find on a front porch or in large home and garden store. It is not a true fern, but this fern-relative is still a non-flowering, archaic plant. All our plants in this collection fit inside a greenhouse room, but the ancestral Rock Tassel Fern grew to the size of trees when fern shared the planet with the dinosaurs. 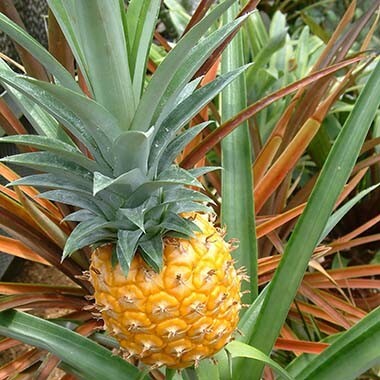 Just as the Dinosaur Garden may remind you of all those ancient plants that transformed into coal, supporting our economy and standard of living, these economic plants may remind you of how the need and desire for nutritious and tasty foods have shaped human history and modern living. Our Economic Room hosts many plants who provide us with common food, including a miniature orange tree, chocolate tree, allspice tree, pineapple plant, vanilla vine, and many others. As you walk by plants that provide us with such familiar food, take the time to remember our ancestors walking by these plants for the first time. Many of these plants’ culinary uses are not immediately evident to an explorer or passer by. This garden offers you the opportunity to reflect on how these foods have been so influential to our history and modern lives. 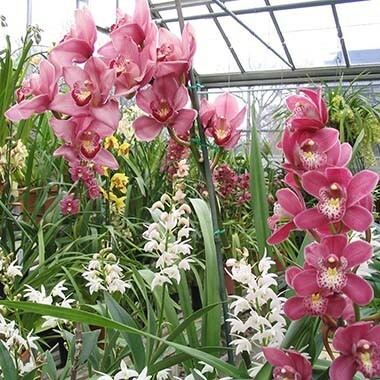 The Orchid Room hosts the largest collection of orchids in Charlotte. This room is blooming and beautiful year-round, but the greatest diversity of orchids bloom during the winter. With over 25 thousand species, the orchid family (arguably) has more species than any other plant. They grow on every continent except Antarctica, and have very large flowers compared to their stems. Their scents are too complex to be replicated in perfume and vary wildly from the sweet smell many people expect to something smelling like coconut sunscreen. These attractive, prosperous plants helped provoke the founders of the UNC Charlotte Botanical Gardens to build the McMillan Greenhouse. Visit the Orchid Room to see some of the original collection of plants that started this greenhouse. The Tropical Room is different than all other rooms in the Greenhouse. This room is home to the Titan Arum, but don’t overlook everything else! After walking down the staircase into this room, the tall, lush plants of this collection surround you from above and the sides. On the ground, a waterway flows over rocks, filling this warm space with tranquil sounds. The banana tree in this collection grows to the ceiling of the greenhouse and produces striped bananas. These bananas are firmer and tarter than those sold in grocery stores. Another plant that captures visitors’ attention is the White Bat Flower, which has long, thin appendages and purple flowers. This collection offers a balance between visually stimulating plants and a peaceful atmosphere.